In the wake of suicides and international scrutiny, Foxconn Technology is preparing to build...another enormous factory. This year, there have been 12 attempted suicides and ten deaths at Foxconn's Shenzhen complex. Foxconn manufactures the Xbox 360, the PS3, the Wii, the iPhone and the iPad, among many other devices. USA Today reports that a website notice on a local government site in the Henan city of Hebei states that Foxconn is aiming to recruit approximately 300,000 workers for a new factory. Foxconn would not officially comment on this. Foxconn's Shenzen factory has offered workers the chance at a 66 percent raise or $292 a month. That 66 percent raise is performance based; however, all employees at the Shenzhen factory have been given raise from $130 a month to $175 a month. This has worsened the financial forecast for the company as workers demand higher salaries and better working conditions. 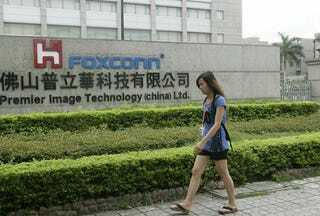 Terry Gou, who is the chairman of Foxconn's parent company, has told investors that the current China factory model might not be sustainable, states USA Today. According to the news source, China has been pushing Taiwan, Hong Kong and other foreign investors to move their factories to inland China as that is where many of the migrant workers come from. The Hebi city website mentions that the basic wage of US$176 a month during a three-month probation period, with a total income up to $340. The monthly salary raises to $300 with a total income of $440 after passing examinations. (USA Today did not mention what the "total income" referred to.) One day a week is guaranteed off and overtime is limited to three hours a day, the website stated. And if and when things go sour in Hebi city, Foxconn can open up shop someplace else. There will always be workers willing to work and companies keen to outsource their goods.